In this delightful tomb the entire roof has been painted with a creeping vine. Interesting use has been made of the rough surfaces of the rock to make the grapes and vine-tendrils appear realistic. Both the first small chamber and the main hall, w hich is supported by four pillars, have been decorated in this manner. Sennofer was the Overseer of the Gardens of Amon under Amenhotep II. In his tomb the paintings are in near-perfect condition. A steep flight of stairs takes us down to the first chamber and the first representations we meet, on the left-hand wall (a), show Sennofer being brought offerings from his daughter and ten priests. 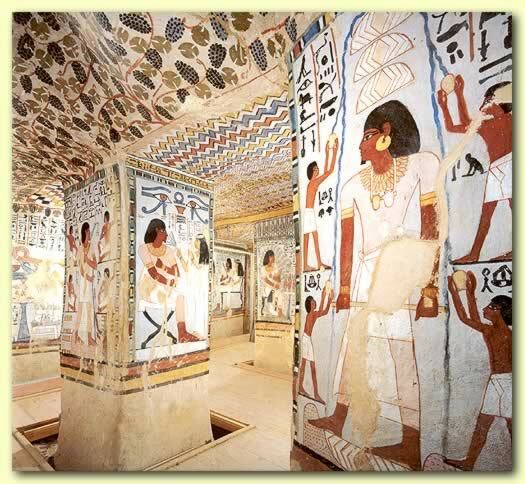 Circling the chamber clockwise, we see on the two rear walls (b) and (c) drawings of the deceased with his wife worshipping Osiris, who is represented above the doorway of the main chamber. 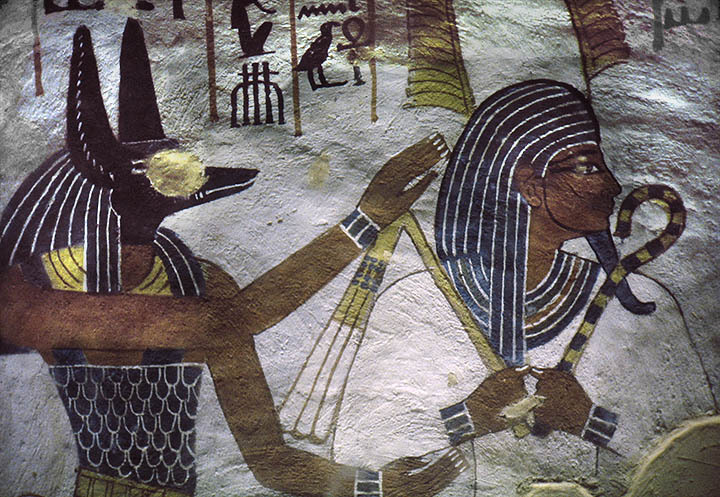 On the right-hand wall (d) the deceased is seen entering and leaving his tomb, while servants bring sacred offerings and his daughter stands behind him. Above the doorway of the main chamber are two representations of Anubis. Moving clockwise, we come first to a scene of the deceased and his wife emerging from the tomb (e) and, further along, seated on a bench. On the left-hand wall at (f) servants bring furniture to the tomb and set up two obelisks in front of the shrine. At (g) are funerary ceremonies, and the nobleman (to the left) looks on. On the rear wall (h) the deceased and his wife are at a table of offerings, while priests offer sacrifices to the dead. 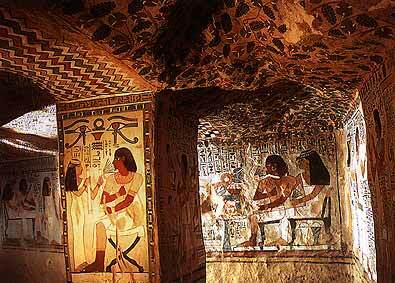 The symbolic pilgrimage to Abydos (page 19) is depicted at (i). It shows statues of the deceased and his wife in a boat, being towed by another boat. One of the most beautiful representations is that of the deceased and his wife in an arbour (j) praying to Osiris and Anubis. At (k) a priest clad in a leopard skin purifies them with holy water; at (1) Sennofer, who puts a lotus blossom to his nostrils, is shown before a table of offerings; his wife tenderly holds his leg.